We have a small library in our home that is just the perfect size for a self-serve dessert table. This 30″ round wooden table (the kind you screw the legs into that sells for about $8 at stores like Walmart) is draped in a soft buttery yellow 90″ cotton linen. It’s just the right size for people to walk around without tripping over the existing furniture. The point of setting it up in the library is to get people moving around the house. 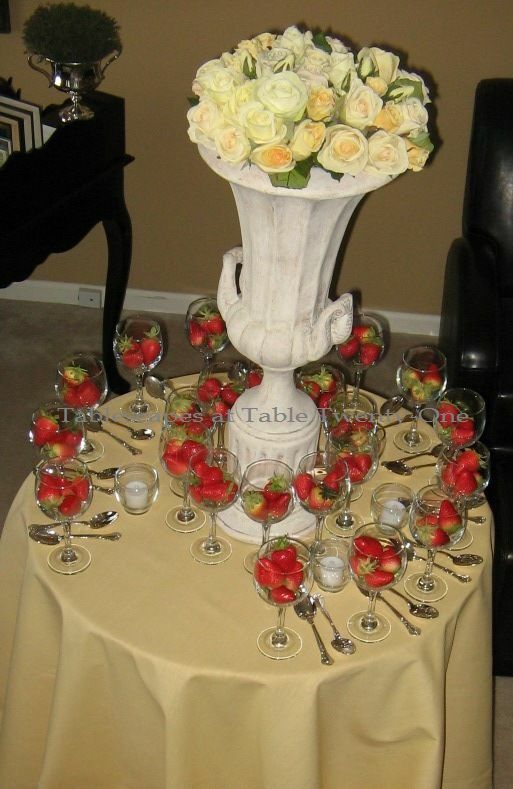 They can pick up a dessert and then linger to chat or take in the decor. I like to set small stations like this up in 2 or 3 rooms (don’t forget about hallways or the foyer!) starting with hors d’eouvres. Note: Something like this works really great for cocktail parties!!! Inexpensive clear wine glasses from Old Time Pottery act as serving vessels. Pictured here are 23 wine glasses, but a 30″ table can accomodate up to about 40 depending on the size and how they are spaced. I opted to leave an artistic open space at the front of the arrangement, but a full circle would work just as well. A few votives in holders that are a shape similar to the glasses give shimmer and shine to the table. It looks absolutely gorgeous at twilight!!! For a daytime event, simply omit the votives. I’m linking up with Cuisine Kathleen’s “Let’s Dish!” again this week. Join us, won’t you? What a great dessert table. 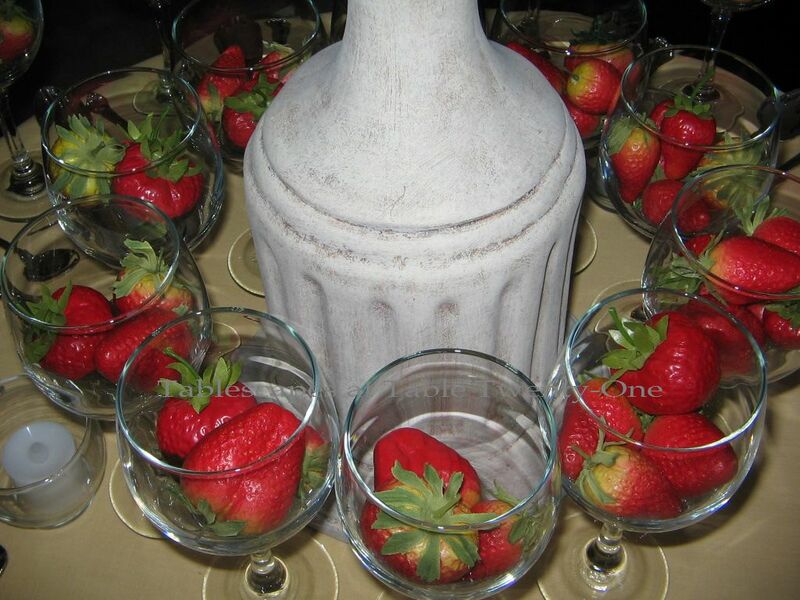 It would be fun to have champagne flutes all ready with strawberry slices to pour champagne in! 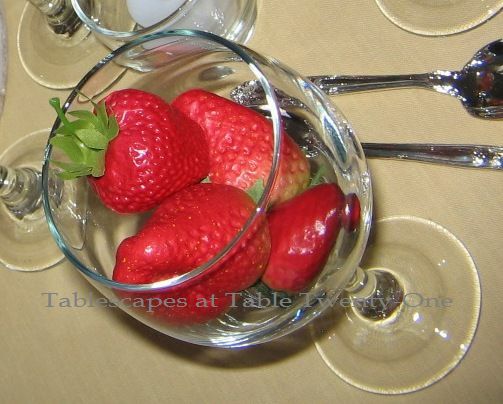 Great idea to have strawberries in the library and they look fabulous. We have a small house and I’d love to have dessert or drinks in another room. Thanks for mentioning the 30″ round table. I need one that size, and I like using the 90″ table cloth… now, if I could get everyone out of the kitchen at the next party. Maybe this will work. Hey what a great idea! I love the idea of having different tables in different spots to get people moving around! I love the idea of a dessert table! My aunt used to have one that she’d set up with a big punch bowl and hand made desserts all around. It was always a popular spot! I find people stall in the kitchen or near it and make it very uncomfortable. This is a good way to get them moving along somewhere else! What a great idea, and I’m writing this down for my future parties. Having different tables in different rooms will help get some of the folks out of my kitchen! (I hope) LOL! I am with that other Ellen, too! 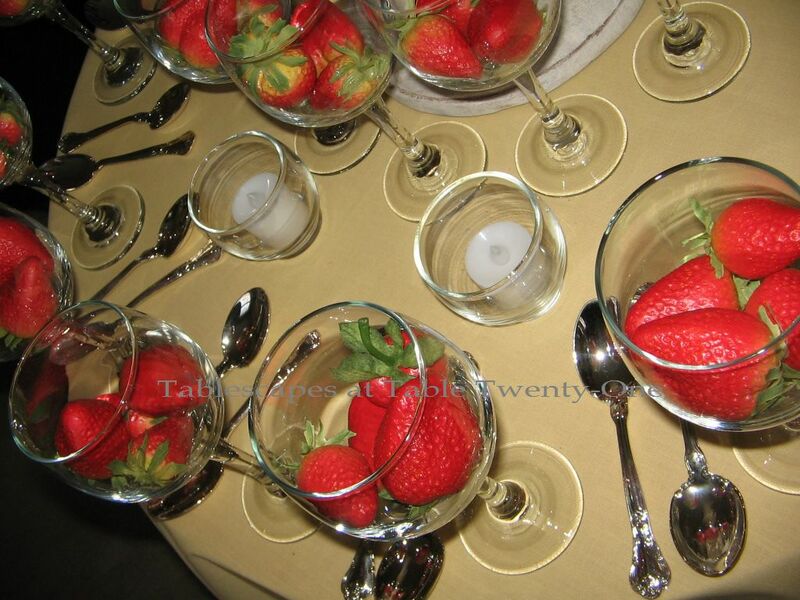 Champagne and strawberries are a great dessert! You always do everything so beautifully, and we always learn something important about entertaining from you. I want REAL strawberries in YOUR library! I love dessert served in stemmed glasses~ it seems more festive…heck, I love anything served in a stemmed glass 🙂 Beautiful & dramatic presentation with the urn on the table! Oh I like these ideas a lot. I have several ( a cabinet full of) medium sized ice cream soda glasses that I inherited that would be great for fruit. I’ve done puddings in them before for desserts but never ever thought of fruit, even though they are the perfect size for that. I love the idea of setting up several different stations. I’ve never really done this before either and would love to try it out! Those small round tables are wonderful for this type of thing. Excellent post chock full of great entertaining tips! Thank you!!!! How pretty — I know your ladies are loving all the ideas you’re sharing. What a fun class to offer. Love the idea of tables filled with pretty presentations of little desserts, drinks, hors d’eouvres…how fun to eat your way around the house. Beautiful dessert table. 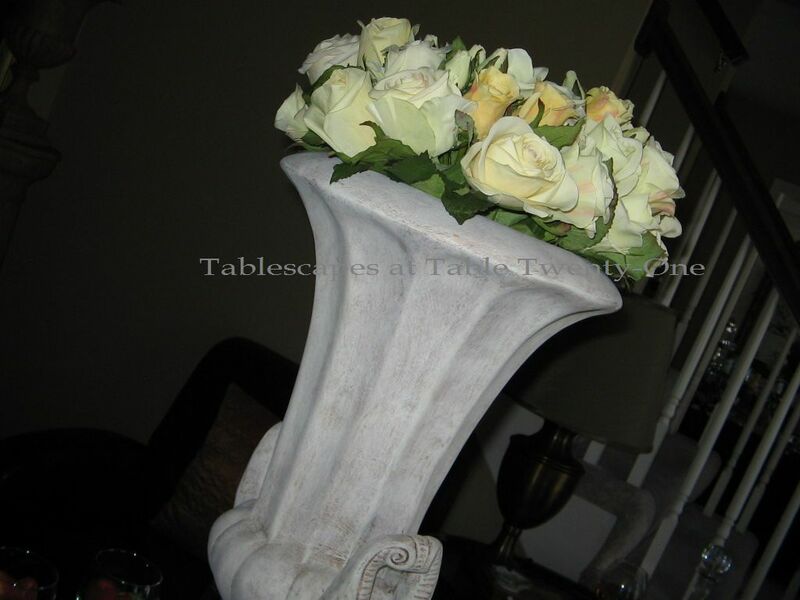 The urn filled with roses makes a stunning statement. Great idea! I’m sure the class is fun! This is a wonderful idea, and I will tuck this one away for future use. I like the height of the urn you used, too. Beautiful! I have to go measure those tables I have. They are in the basement. I used them for night tables while waiting for our furniture to arrive. I never imagined they could hold that much! I could even use them outside to spread out the hors d’s! I would scream if champagne was the only dessert though! You better have some cake or brownies for this tea totaler! :). A glass full of strawberries with whipped cream would be fine though! Thanks for linking up to Let’s Dish! 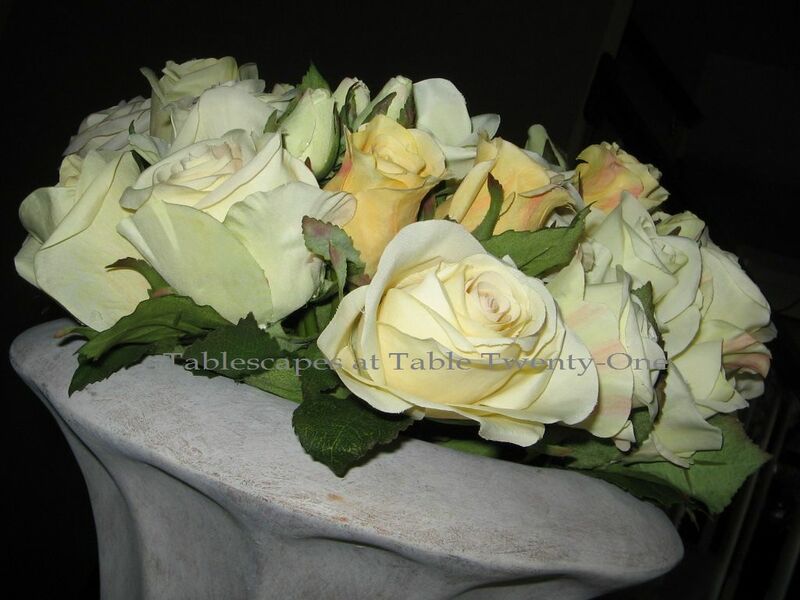 What a fabulous presentation, Alycia…love the urn filled with roses. Are you making fun about Jello…I love raspberry flavored beaten with whipped cream!